One of the most underappreciated Final Fantasy titles has been confirmed for release on the PlayStation Network. After many hints, Square Enix CEO Yoichi Wada has confirmed that Final Fantasy IX will be released as a download on the PlayStation Network in Japan. The game is expected to come to other territories as well, but videogame companies work in mysterious ways so we'll have to wait for an official announcement. 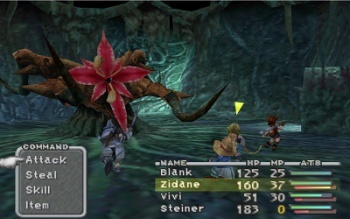 As translated by Andriasang, Square Enix producer Shinji Hashimoto said he would bring up the idea of releasing Final Fantasy IX on the PlayStation Network in a meeting, and promised that there would be news soon. Thanks to a tweeted video by Yoichi Wada announcing the game's digital release, that news has arrived. Pricing and a release date were not announced, but the game is likely to cost around $9.99, the same price as the digital releases of Final Fantasy VII and Final Fantasy VIII, both of which have been released on the PlayStation Network worldwide. Final Fantasy IX apparently did not reach the sales numbers of previous PlayStation Final Fantasy titles. Regardless, sales of both Final Fantasy VII and Final Fantasy VIII on the PSN have been stellar, and steady as well, so Square Enix basically can't lose by re-releasing IX. Final Fantasy IX marked a return to a more traditional, super-deformed fantasy setting after VII and VIII gave the series more of a futuristic tone, which is probably why many gamers introduced to RPGs with VII failed to take notice. Up until Final Fantasy VII, Final Fantasy had taken place in worlds populated by goblins, knights, and magicians, though Final Fantasy VI did add a steampunk edge. Final Fantasy IX starred thief-with-a-tail Zidane, knight Steiner, black mage Vivi, and Aeris wannabe Princess Garnet. The detailed equipment system was also more traditional, and equipping items was a way to teach characters new abilities. Final Fantasy IX's characters are a little too cutesy even for my tastes, but the game is a must-play for every RPG fan. If you missed it during the PS1 era, give it a go when it (most likely) comes to your region on the PlayStation Network this year.